JERUSALEM (AP) — Shimon Peres was laid to rest Friday by dozens of world leaders who praised Israel’s former president and prime minister for pursuing peace with an indefatigable spirit and optimism, even though his vision of a “new Middle East” was never fulfilled. At a high-powered funeral befitting the globe-trotting Peres, speakers including President Barack Obama recalled a seven-decade political career that personified the history of Israel by building its military while also pushing it toward peace. 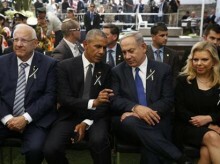 “He knew better than the cynic that if you look out over the arc of history, human beings should be filled not with fear but with hope,” Obama told the mourners, made up of delegations from 70 countries — an assembly of dignitaries unlikely to be seen in Israel again. Peres, who shared a Nobel Peace Prize in 1994 with former Prime Minister Yitzhak Rabin and Palestinian leader Yasser Arafat, died Wednesday at age 93. Among the mourners were French President Francois Hollande, Britain’s Prince Charles, German President Joachim Gauck and Canadian Prime Minister Justin Trudeau. Despite the stalemate in peace talks, Palestinian President Mahmoud Abbas sat in the front row alongside other world leaders. Representatives from Egypt and Jordan also were present. Obama described the unlikely friendship he forged with Peres, given their vastly different backgrounds, and he likened him to South Africa’s Nelson Mandela. The ceremony was Israel’s largest gathering of international dignitaries since Rabin’s funeral, and was one of the most complicated logistical and security operations ever undertaken. It required closing the main highway from Tel Aviv to Jerusalem and deploying thousands of security forces. Peres led Israel through some of its most defining moments: creating what is believed to be a nuclear arsenal in the 1950s; disentangling its troops from Lebanon and rescuing its economy from triple-digit inflation in the 1980s; and guiding a skeptical nation into peace talks with the Palestinians in the 1990s. A protege of David Ben-Gurion, Israel’s founding father and first prime minister, Peres served in parliament for nearly half a century, held every major Cabinet post, including defense, finance and foreign affairs, and served three brief stints as prime minister. He was the country’s elder statesman as its ceremonial president between 2007 and 2014. He also created his non-governmental Peres Center for Peace, which raised funds and ran programs for cooperation and development projects involving Israel, the Palestinians and Arab nations. He was a proponent of Israeli technology and innovation, and gained international recognition for preaching peace and coexistence. With his passing, Israel lost its final link to its founding generation, giving the funeral a sense of the end of an era. Netanyahu said he was a fierce political rival of Peres, Israel’s leading dove, and that the two had vastly different world views. But he said that never got in the way of a strong personal relationship built since 1976, when Peres, as defense minister, ordered a hostage rescue mission in Entebbe, Uganda, in which Netanyahu’s older brother, Yoni, was killed. “I loved you. We all loved you. Farewell, Shimon. Dear man. Great leader,” an emotional Netanyahu said. Peres’ son, Chemi, and his devoted staff of assistant broke down in tears during a performance of the prayer “Avinu Malkeinu,” or “Our Father, Our King.” Jews sing the prayer on the Day of Atonement, which falls this year in mid-October, and Peres had requested singer David D’or perform it at his funeral. Thousands of mourners viewed Peres’ casket Thursday outside the parliament building. Early Friday, an honor guard escorted the flag-draped casket, along with Peres’ family, on the short route to the cemetery. Following the eulogies, eight members of an honor guard carried the casket to the gravesite. Netanyahu and Obama chatted along the way, also speaking to Peres’ family. The coffin was lowered into a plot alongside two other prime ministers, Rabin and Yitzhak Shamir. Soldiers passed bags of dirt to cover the casket, and a military cantor recited the prayer for the dead. Then it was covered in wreaths. Peres’ daughter, Tzvia Walden, recounted her father’s boundless energy, his persistent pursuit of peace and his refusal to retire, even his in 90s.